Young Justice is finally back from a 112 day hiatus and it picks up right where we left off. In this episode the Original Roy seeks vengeance against Lex Luthor. Meanwhile the rest of the team mourns Artemis’ “death”. 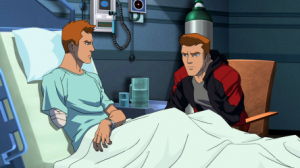 Clone Roy and Green Arrow visit Original Roy at the hospital to fill him on what happened when he was frozen. Turns out he’s been missing for 8 years. Urgh. Poor baby. Roy isn’t upset with his clone for taking his place, but now he wants nothing to do with Green Arrow. Roy can’t forgive him for not trying harder to find him and not realizing that a clone had taken his place. Wow. I did not expect to be assaulted with all these feelings first thing Saturday morning. Clone Roy and Green Arrow leave Original Roy alone for a few minutes and when they come back, Roy has disappeared. Meanwhile, Beast Boy, Robin, Blue Beetle, and Impulse are gathered in the grotto, observing the hologram statues of fallen heroes. One of these statues is Artemis, of course. Oh, the dramatic irony. Another one of these statues is Jason Todd. Are they serious right now? Are they trying to kill me? I ‘m crying at this point (again). I have a lot of feelings about Jason Todd. Does this mean we’ll have flashbacks of Jason or even Red Hood on the show? I would give anything to have that. Cheshire and Sportsmaster visit Artemis’ grave and vow to take revenge on Aqualad and Black Manta. The dramatic irony is laid even thicker. Luckily there are some cute moments to even out all my emotions. Superboy turns 6 in this episode. Happy birthday to him! Apparently he goes to college now, and so does M’gann. M’gann laments about not be able to throw Superboy a party because they’re not together anymore. Whatever, I don’t even care. I just hope these two don’t angst over each other for the rest of the series. I’m 500% done with their relationship garbage at this point. Later the girls get together for Rocket’s bridal shower. It’s a really sweet, human moment. Original Roy finds his way to Lex Corp, determined to get vengeance on Lex Luthor for taking away 8 years of his life and cutting off his arm. Lex offers him a robotic arm to replace the one he lost in exchange for giving up his plans for vengeance. Roy accepts his offer. Later he decides to go by the name Arsenal from now on. 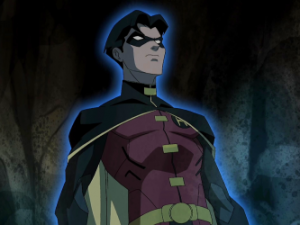 So if he’s going to be Arsenal does this mean they’re going to introduce Red Hood into the show? I sincerely hope so.